With the westerly winds having now set-in, it's not really that surprising that there haven't been too many new arrivals. We persist with our efforts though and old favourites seen on 23rd were the Pectoral Sandpiper (on Gretchen briefly), Short-toed Lark (Kirbest), Barred Warbler (Upper Linnay), Red-breasted Flycatcher and Yellow-browed Warbler (both Holland). On 24th, it was worth being up early morning with the some southbound Goose passage taking place during the first couple of hours. With the clear conditions the birds passed very high up but 599 Pink-footed and 182 Greylag Geese were counted, and there were also 332 unidentified 'Grey Geese' which passed down the east side of the island in the sun. There was much debate over the finding rights of the autumn's first Woodpigeon (that's what happens when it goes westerly!! ), and it seems likely there might have been 2 birds. 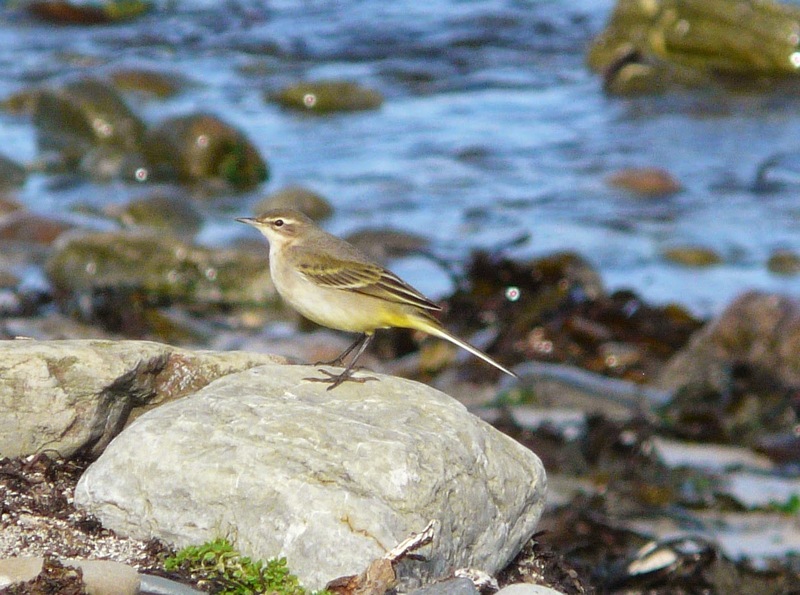 Lingering passerines were 2 Yellow-browed Warblers and the Red-breasted Flycatcher at Holland House, Common Rosefinch in the Ancum area and a 'flava' Wagtail on the beach at Westness. A Wood Warbler was also in Holland, 2 Lapland and 3 Snow Buntings will hopefully increase in number over the next week and at least 7 Grey Herons and 3 Hen Harriers were present. 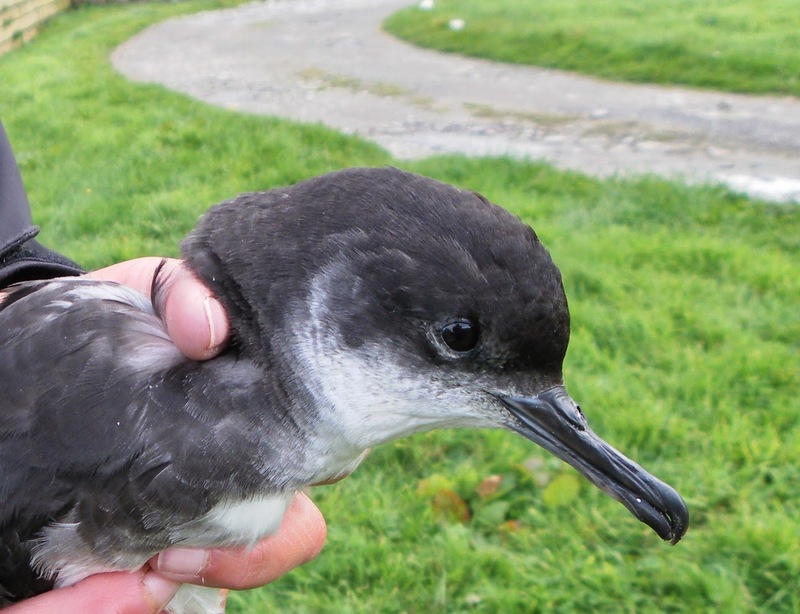 Found at the base of the lighthouse-this slightly confused Manx Shearwater was in good health and upon release in the evening, flew out into Nouster Bay and began feeding. With the strong(ish) westerly wind having subsided to next to nothing by dawn the sea drew some attention as we hoped to latch on to some of the previous days sea-bird highlights in the North sea. There was no Fea's Petrel but 4 hours of effort from 0740 saw a Great Shearwater (0815) pass by along with 74 Sooty Shearwaters, 8 Manx Shearwaters, 1177 Fulmars-including 3 'blue' phase, 384 Gannets and 2 Risso's Dolphins were also seen. Back on dry land, the Short-toed Lark was found again on the driest parts of the fields around Kirbest while the Pectoral Sandpiper has re-located to the nearby Loch at Bridesness. There weren't many new passerines but 3 Red-breasted Flycatchers included new individuals at Hooking and the Pier, with the long-stayer still at Holland gardens. A Yellow-browed Warbler was at Bridesness again, 2 Tree Pipits at the north end, 12 Chaffinches, 5 Bramblings and 5 Lapland Buntings were well spread and 3 Kestrels were also noted. There was an obvious clear-out of the vast majority of the recent migrants with both the Shrike and the Pipit seemingly moving on. Highlights on what felt like a 'static' day were 4 Barred Warblers (2 Ancum Willows, Holland and a new bird at Westness), a Wryneck near Garso, a Red-breasted Flycatcher at Holland, 2 Yellow-browed Warblers (Holland and a new bird at Bridesness) and 3 Common Rosefinch (Holland and 2 at Westness, at least 1 of which will be new). Other passerines included a Grey Wagtail, 2 'flava' Wagtails at Westness, 2 Ring Ouzels, the first Redwing of the autumn, 15 Chaffinch and a Lapland Bunting while 11 Grey Herons included a flock of 9 together at Bridesness. There were limited new arrivals but lingering rarities, including both the Daurian (Isabelline) Shrike and Olive-backed Pipit both showed well again at times during the day. A flighty Pectoral Sandpiper near Kirbest was the best new arrival and along a similar theme an adult Curlew Sandpiper joined the long staying juvenile on the Lochs at the North end. 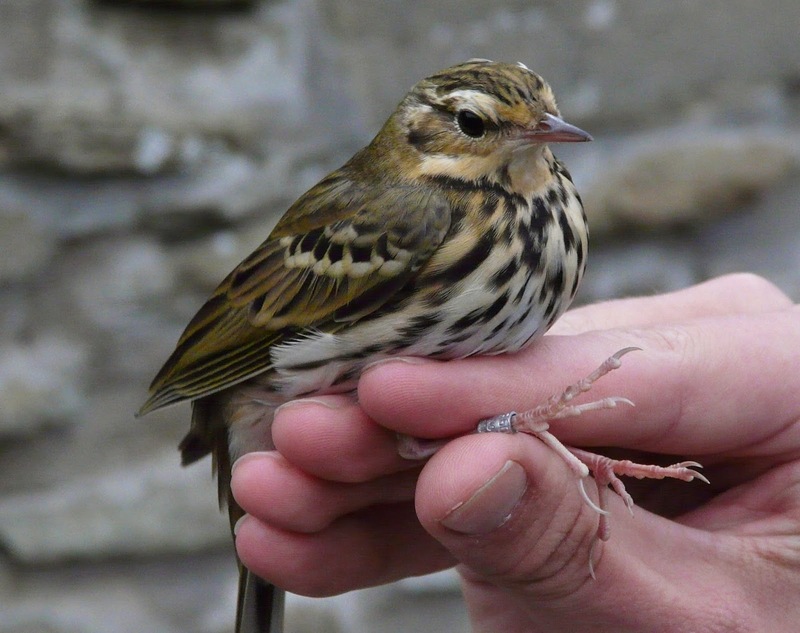 Also seen were 2 Jack Snipe, a 'flava' Wagtail, 2 Tree Pipit, a Grasshopper Warbler (trapped at the Observatory), Reed Warbler, 2 Yellow-browed Warblers (both at Holland), 2 Red-breasted Flycatchers (Beacon and Holland) and the Common Rosefinch (Holland). Most of the week's highlights remained from previous days and there was clearly another wave of common migrants having arrived. 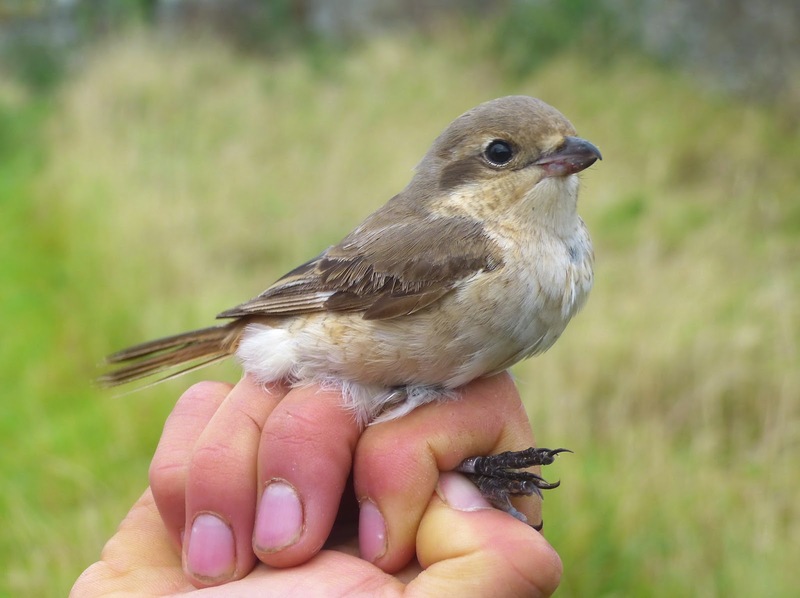 Headlining were the Daurian (Isabelline) Shrike, seen a couple of times in the Holland/Kirk area again having been absent yesterday and the Olive-backed Pipit at the Observatory which conveniently walked into one of our Heligoland traps in the evening and became the 6th to have been trapped and ringed here. There were 2 Little Buntings-the lingering bird at Lurand and a new individual found in the weedy strip fields at Nether Breck while 5 Barred Warblers (Obs, Holland, Greenspot and 2 in the Ancum area) included at least 2 new birds. In Holland gardens the 2 Red-breasted Flycatchers remained and there were 5 Yellow-browed Warblers and 2 Rosefinches seen. Passerine numbers showing signs of an increase were 16 Dunnocks, 6 Whinchat, 29 Blackcaps, 10 Chiffchaffs, 29 Willow Warblers, 10 Chaffinch, 8 Brambling and 34 Siskin with those not mentioned at similar numbers to yesterday. The first Jack Snipe of the autumn was found with the Curlew Sandpiper at the north end again, and there were at least 3 Hen Harriers, 5 Kestrels, the same Short-eared Owl. 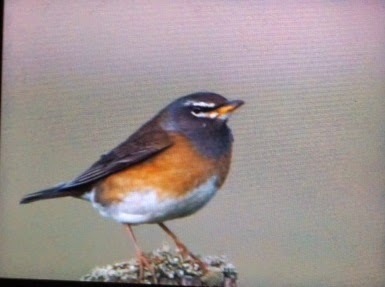 The best of the rest were the Grey Wagtail, a 'flava' Wagtail, Ring Ouzel a Reed Warbler and 2 Lapland Buntings. Another great day which began once more with the now familiar fog and a few rain showers and there was another great bird. This time it was a less than co-operative Olive-backed Pipit which was seen briefly at Lurand early in the morning and then relocated by the visiting Heatherlea tour group a few hours later. It couldn't be found during later searches and this the 21st island record (pending acceptance) will be the earliest by 6 days. 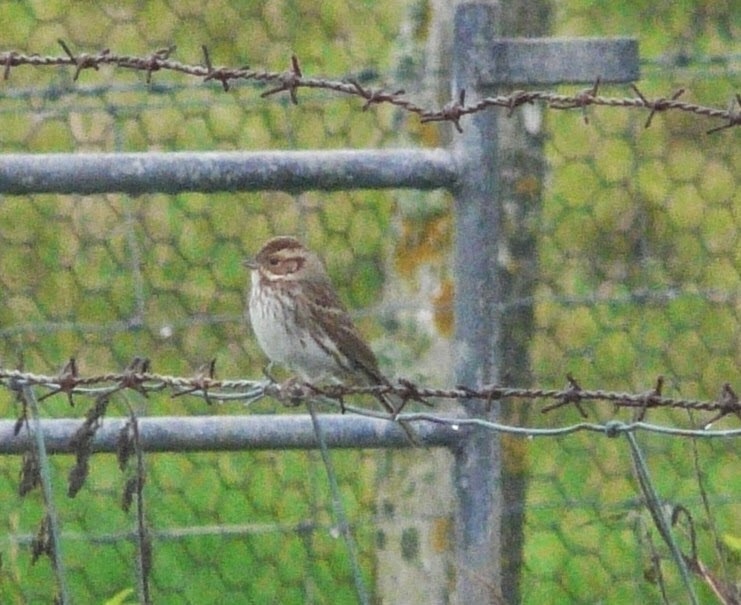 Also in the same area the Little Bunting was still present and the rest of the scarcities were made of the Wryneck (at Rue), 4 Red-breasted Flycatchers (2 at Holland, Rue and a new bird at the Beacon), a Barred Warbler (at North Manse), 2 Rosefinch (Holland and a new bird near the Lighthouse) and 5 Yellow-browed Warblers. Another top day's birding during which the first Short-eared Owl arrived and there were also at least 6 Kestrels present, 5 Grey Herons together at Westness, 6 Common Sandpipers along the West coast and a Curlew Sandpiper on Torness. A couple of Goldfinchs were the first of the autumn and there were 2 'flava' Wagtail, 7 Dunnock, 10 Robin, 5 Redstart, 5 Fieldfare, 44 Song Thrush, the Reed Warbler, 2 Lesser Whitethroat, Whitethroat, 8 Garden Warbler, 25 Blackcap, the Wood Warbler, 9 Chiffchaff, 26 Willow Warbler and 13 Goldcrest while a handful of Finches included 7 Chaffinch and 5 Siskin, while there were 2 Lapland Buntings and the Snow Bunting remains. We've been thoroughly spoilt this week as despite the often foggy and drizzly conditions in the morning, it was another superb and varied days birding. Topping the bill was the re-appearance of the Daurian (Isabelline) Shrike at Holland House in the afternoon. Having avoided detection yesterday, despite fairly extensive coverage of the Island it just goes to show how much potential there is to find your own birds on North Ronaldsay-the team must miss plenty! 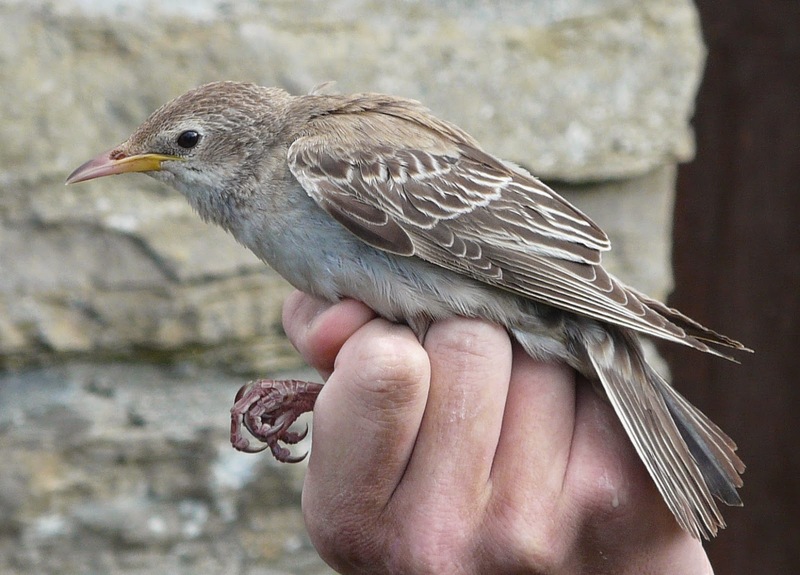 New scarcities included the second Rose-coloured Starling of the autumn near Hooking-a frantic dash for telescopes quickly proved that the bird was un-ringed, hence not the recent individual and will become the 8th island record. 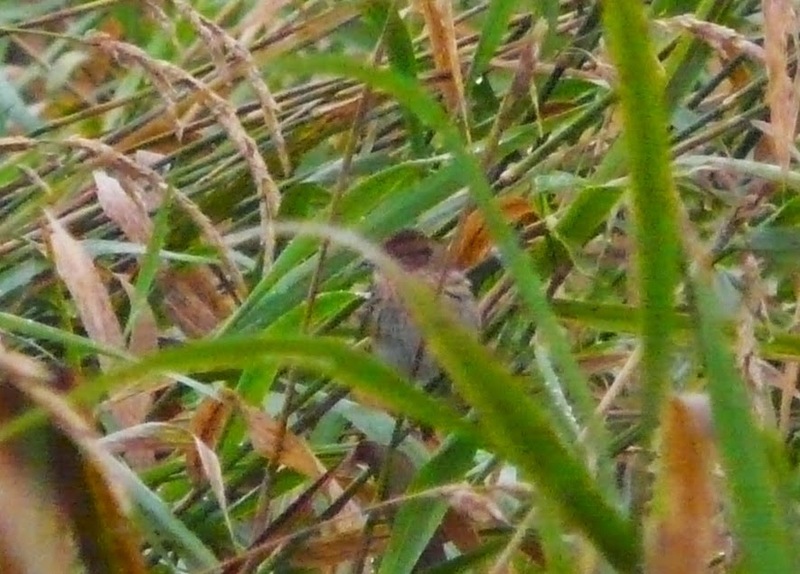 There were 2 Little Buntings, the first in the Irises at Hooking and another near the Observatory. 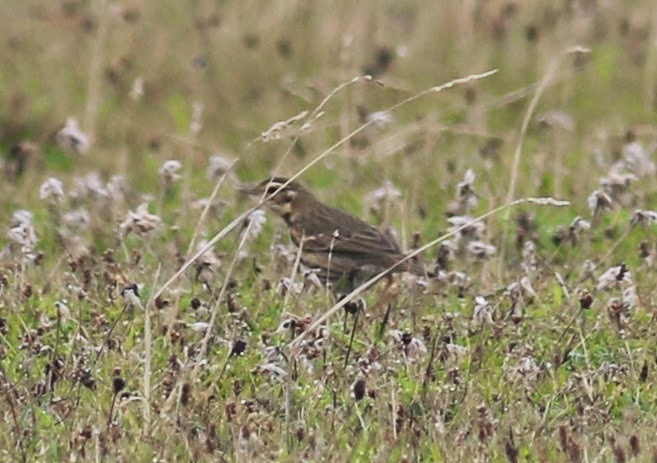 The Short-toed Lark was re-found near Kirbest, there were 2 Wrynecks (Observatory and Rue), 4 Red-breasted Flycatchers (3 in Holland gardens and another at Rue) were likely lingering birds, 3 Barred Warblers (Scottigar, Scots Ha and Holland), 9 Yellow-browed Warblers and the Common Rosefinch still. A busy evenings log revealed some good totals of migrants with Warblers particularly well represented. 2 new Reed Warblers were found and there were also 17 Garden Warblers, 26 Blackcaps, 5 Lesser Whitethroats (including an 'Eastern' type at the post office), the Wood Warbler, 10 Chiffchaffs, 36 Willow Warblers and 8 Goldcrests. A House Martin was new, as were 2 'flava' Wagtails and a Grey Wagtail with other migrant passerines being 4 Dunnocks, 10 Robins, 4 Redstarts, 4 Whinchats, 97 Wheatears, Ring Ouzel, 37 Song Thrushes, 2 Spotted and a Pied Flycatcher, 7 Chaffinch, 3 Brambling, 5 Siskin and single Snow and Lapland Buntings. 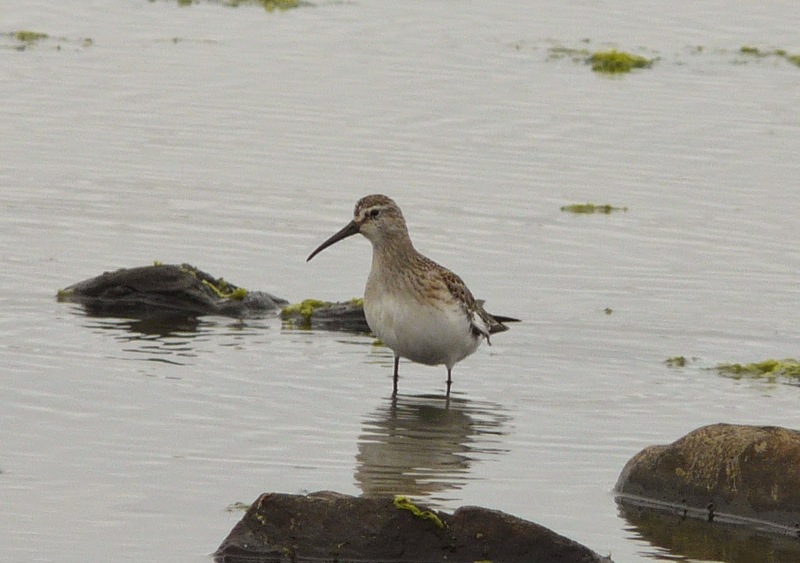 There was a little Wildfowl movement with 5 Pintail, 145 Wigeon and 105 Teal and last but by no means least after a hectic round up- 2 Common Sandpipers on the west coast were the most notable of the Waders. Little Bunting-plenty of imagination needed with this one! 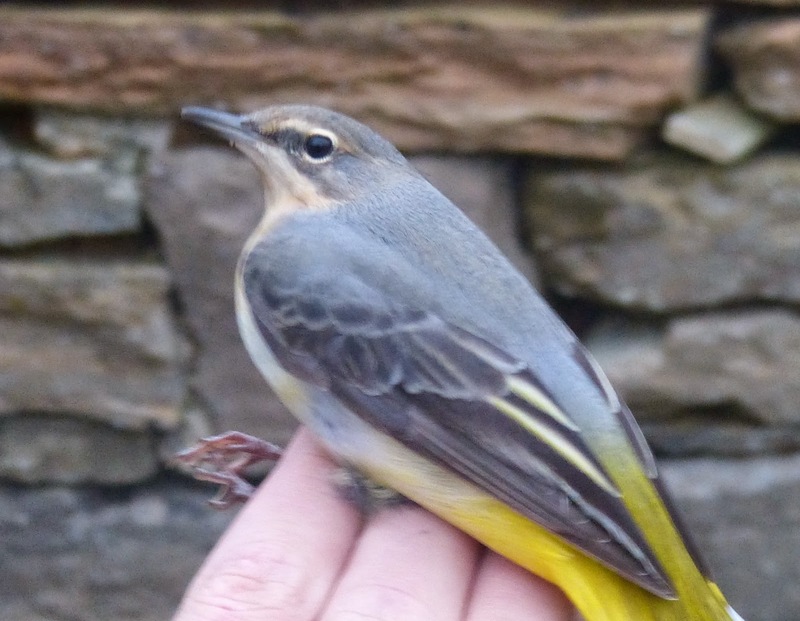 Grey Wagtail-just the 4th to be ringed on North Ronaldsay, caught and ringed late afternoon. Early rain, made birding difficult until after midday but it was certainly worth it with a classic September fall of common migrants and scarcities making for another enjoyable and long day in the field. There was no sign of yesterday's Shrike or the Rose-coloured Starling but new highlights were a Short-toed Lark at Greenwall, a Wryneck at Stennabrek, 3 Barred Warblers (Nether Linnay and 2 at Stennabrek), Common Rosefinch, 4 Red-breasted Flycatchers (at least 2 new) and an impressive 13 Yellow-browed Warblers. 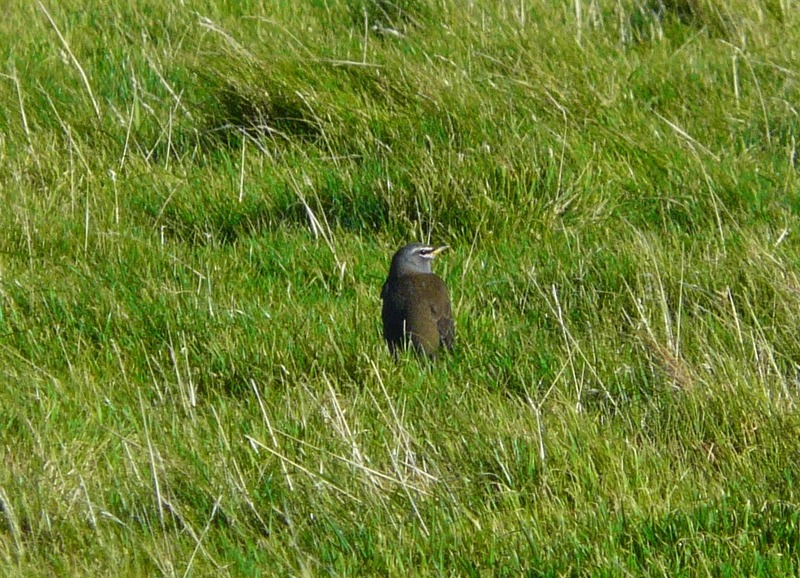 An Acrocephalus Warbler (probably a Marsh) frustrated in the irises at Kirbest and other passerines included 4 Tree Pipits, 4 Dunnocks, 6 Redstarts, Ring Ouzel, 3 Fieldfares, 37 Song Thrushes, a Grasshopper Warbler, a Reed Warbler, 2 Whitethroats, 8 Garden Warblers, 23 Blackcaps, the Wood Warbler, 33 Willow Warblers, 10 Goldcrests, a Spotted Flycatcher, a Chaffinch, a Brambling and 2 Lapland Buntings. 6 Sooty Shearwaters were seen during an hours sea-watch and the Curlew Sandpiper remains at Trolla Vatn and 2 Common Sandpipers were near Howar. It certainly felt like there were a few birds starting to arrive, especially during the afternoon when the days highlight-a Red-breasted Flycatcher appeared in Holland gardens. Earlier 2 Barred Warblers at Ancum Willows included at least 1 new bird, while other notable passerines included the first 2 Song Thrushes of the autumn, lingering Wood Warbler and a scattering of other Warblers including 9 Willows. 2 Curlew Sandpipers (first of autumn) and 4 Little Stints were the pick of the waders and 7 Red-breasted Mergansers were the first of the autumn too. Fog has hampered proceedings somewhat over the last couple of days. but we remain optimistic with a few new arrivals noted each day despite the conditions. 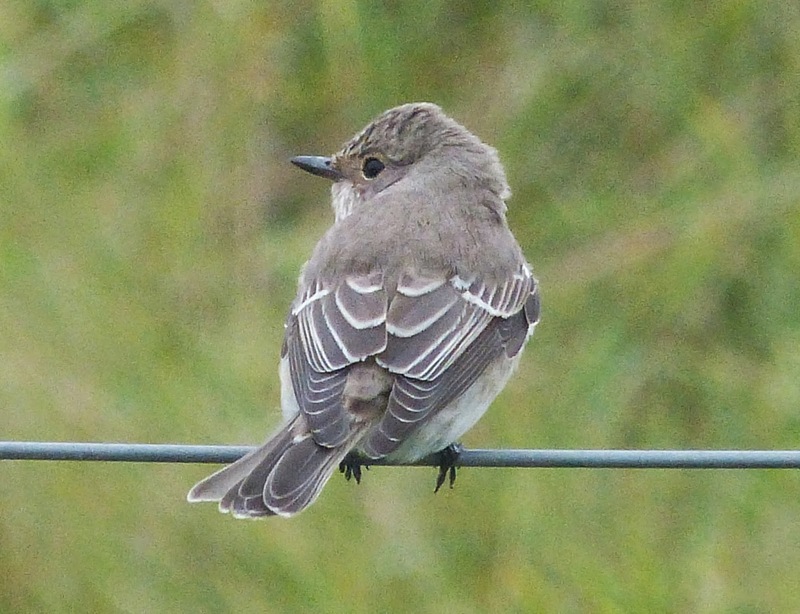 A Barred Warbler at Cott on 12th was new, a Lapland Bunting at Nether Linnay while the Rose-coloured Starling remained at the observatory, as did the Wood Warbler and Pied Flycatcher at Holland gardens. 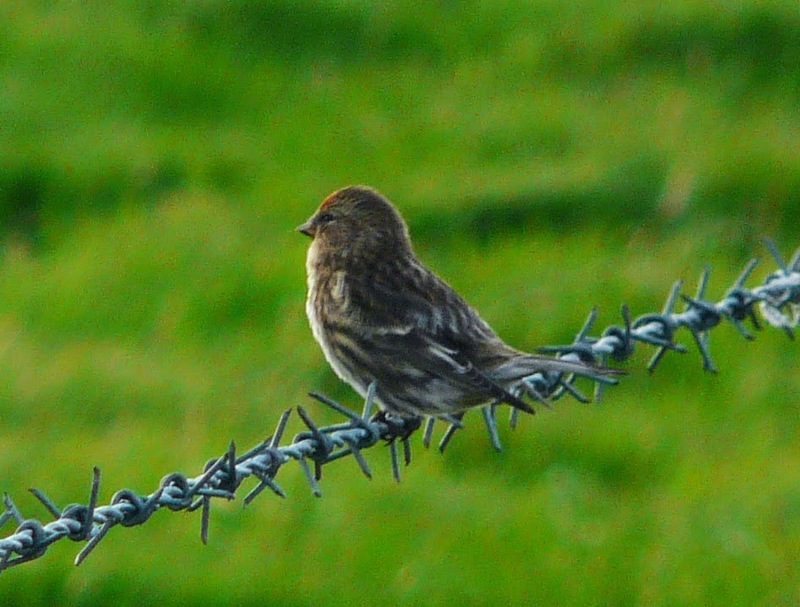 A ringed Common Rosefinch there on 13th was presumably a bird from earlier in the week but a 2nd bird, minus the jewellery at Burray was definitely new. The first 16 Pink-footed Geese of the autumn battled with the poor visibility and up to 2 different Peregrines, 2 Kestrels and 2 juvenile Hen Harriers were seen over the two day period. 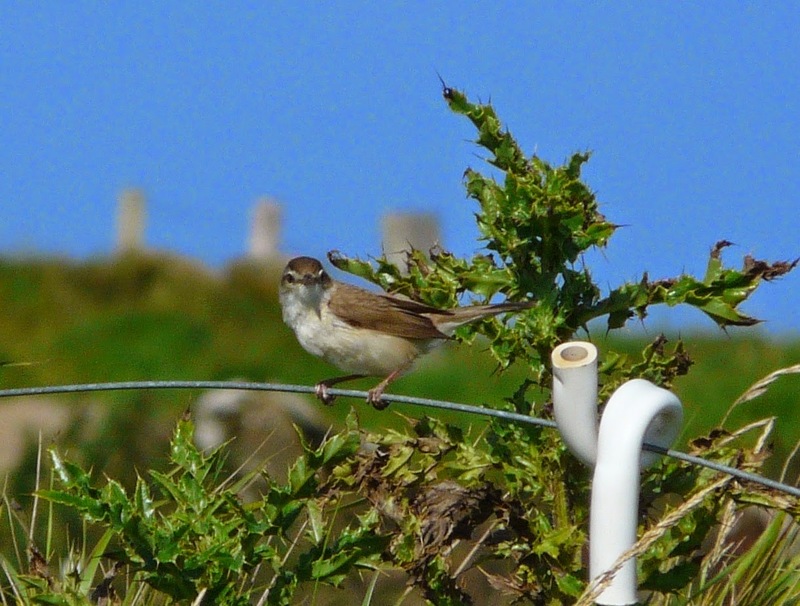 Highlights were the re-appearance of the Paddyfield Warbler near Stennabrek and the juvenile Rose-coloured Starling at the bird observatory. 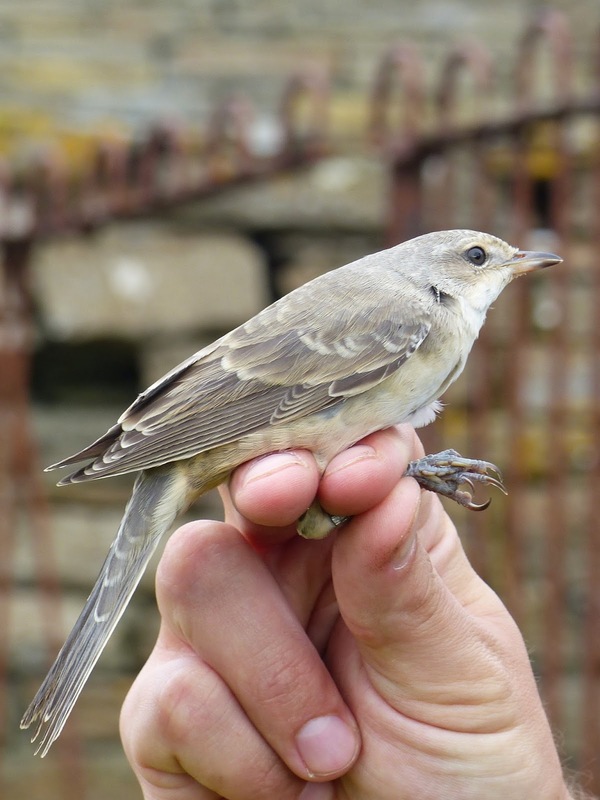 New Barred Warbler and Common Rosefinch, along with the Wood Warbler at Holland House continued a good spell for scarce migrants, where the bulk of other migrant passerines appear to be with the Redstart, Goldcrest, 3 Lesser Whitethroats and Garden Warbler on 10th, when a House Martin was an unusual find in the mist-nets. Snipe continue to arrive with 219 whilst 3 Little Stints, 9 Ruff and a Grey Plover were at Bridesness. 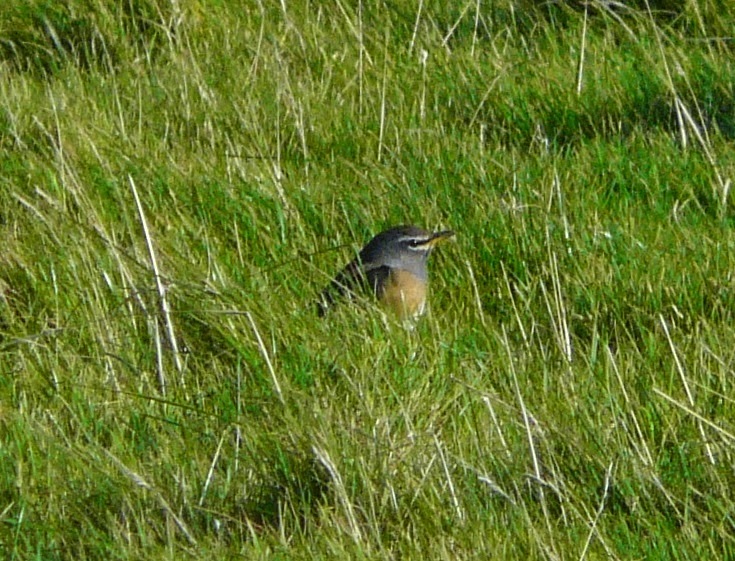 A single Whinchat, the Fieldfare, a Sparrowhawk and 2 Kestrels were seen elsewhere. Much the same followed on 11th with 2 Robins, a Blackcap, 6 Willow warblers and a Pied Flycatcher all fore-mentioned site, with 2 newly arrived Mute Swans the only other new arrival. The sun was back out again and although it was a quieter day than expected the early indications from ringing at Holland were of a handful of newly arrived, lightweight migrants. 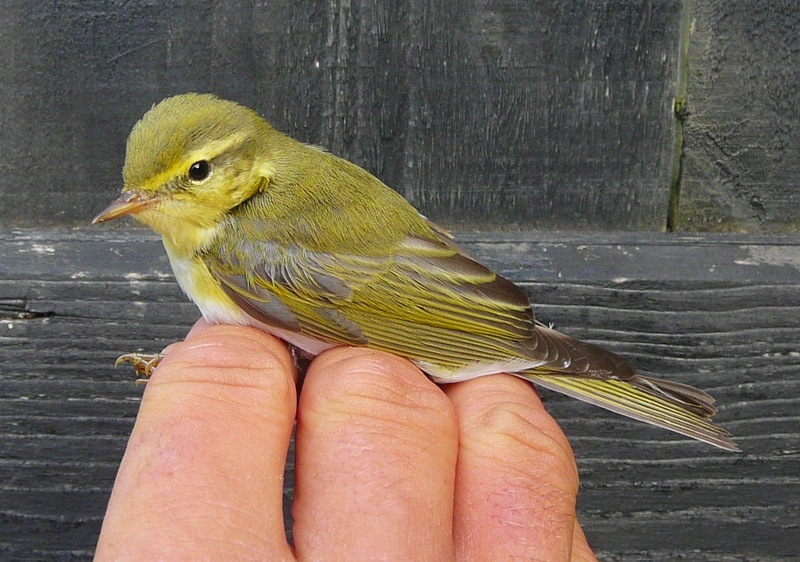 Singles of Wood Warbler, Redstart and Common Rosefinch trapped and ringed were however likely to be birds from the previous day, but most of the 7 Willow Warblers were new. A flock of 21 Ruff were in the fields nearby and there were 19 Black-tailed Godwits in the Bridesness area. 7 Tufted Ducks and 2 Pochards were also there, a couple of Hen Harriers seen and single Tree Pipit and Common Redpoll were the best of the rest. Torrential rain all day, rendered the 7th pretty much un-birdable with the only attempt to get out in the field being a few hours soaking just before dark. A Tree Sparrow at Ancum was notable but the only other birds worth reporting were 9 Ruff. 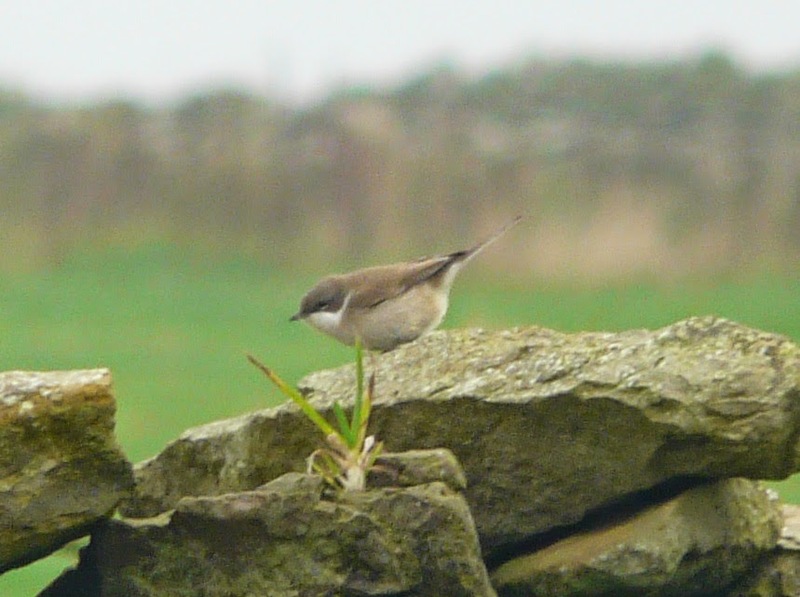 The wind and rain abated on the 8th allowing a few new passerines were found and it seemed as though most of last weeks Warblers had moved on to be replaced by a new batch, including a Wood Warbler at the airfield, the first Lesser Whitethroat of the autumn and there was also a Redstart at Holland. Large numbers of sea-birds were on the move again off the north end with a 2 and a half hour watch returning totals of 1035 Fulmars (including 2 blue phase birds), 338 Gannets, 21 Sooty and 4 Manx Shearwaters, a Storm Petrel and a smart drake Velvet Scoter-the latter becoming the 200th species recorded by the observatory on the island in 2014. The juvenile Rose-coloured Starling was still around the Obs during the morning and there were also at least 3 Kestrels and 2 Hen Harriers present. A few showers didn't spoil another largely sunny day when a smart juvenile Rose-coloured Starling was a fantastic highlight, found just after midday at Lurand near the observatory. Associating with a flock of 30 or so Starlings, it didn't take long for the bird to find it's way into the crow trap, where this 7th for the island became the 1st to be ringed here. Other passerines were mainly lingering birds, with a Barred Warbler and 2 Common Rosefinches at Holland House although there were 2 new Blackcaps there. A 2 hour sea-watch in the morning yielded 15 Sooty and 3 Manx Shearwaters and 503 unidentified Auk sp. was their first notable count. A male Merlin replaced yesterday's female and there were now 6 Little Stints and 3 Whimbrel flew south. The autumn continues to build in pace and today there was plenty of variety on offer although once again it visible migration which was the most evident with Pipits and Wagtails moving through especially in the afternoon. 532 Meadow Pipits were counted and there were 28 White, 37 Pied and 60 unidentified 'alba' Wagtails and 78 Wheatears-again most, if not all were Greenland types. The Paddyfield Warbler remains in its chosen thistle field at Stennabrek and showed much better in the sunshine today. 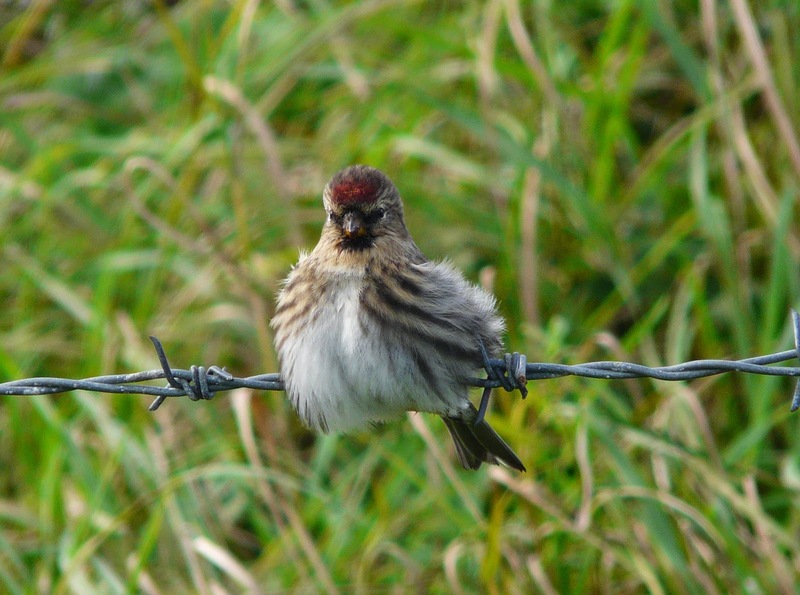 There were 3 Common Rosefinches at Holland House while Barred Warblers at Nether Linnay and near Bridesness were probably both new, as was a Lapland Bunting and roughly half of the 17 Willow Warblers logged. The Spotted Redshank remains, there were now 4 Little Stints and 39 Black-tailed Godwits included 18 which passed south straight over the island. Raptors were similar to yesterday with 2 Hen Harriers, 3 Kestrels, female Merlin and a Peregrine. There were also increased counts of some wildfowl with 97 Wigeon and 118 Teal the most notable. 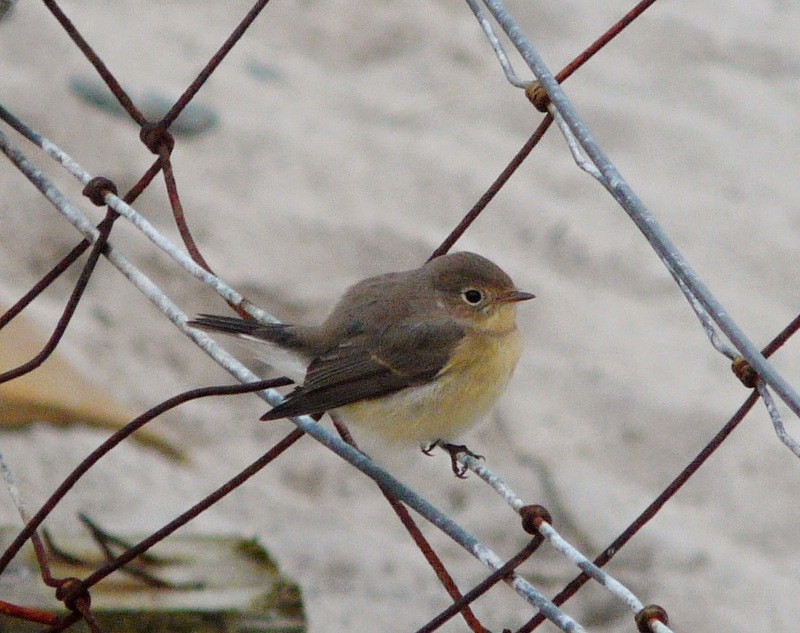 A busy day, in which it was clearly evident there were birds on the move in the morning and plenty of Warblers were grounded in the afternoon. 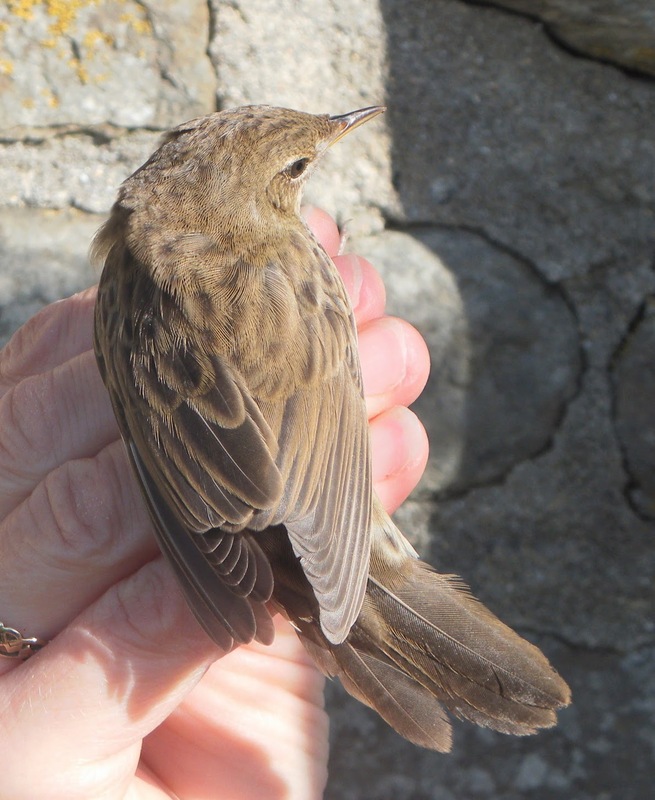 Early on Meadow Pipits and Wheatears (mainly Greenland) were prominent recording figures of 562 and 76 respectively. From the afternoon, newly arrived Warblers included 2 new Barred, a Wood Warbler, 2 Sedge, 3 Blackcaps and 9 Willow and there were also 2 Whinchats and 3 Pied Flycatchers. 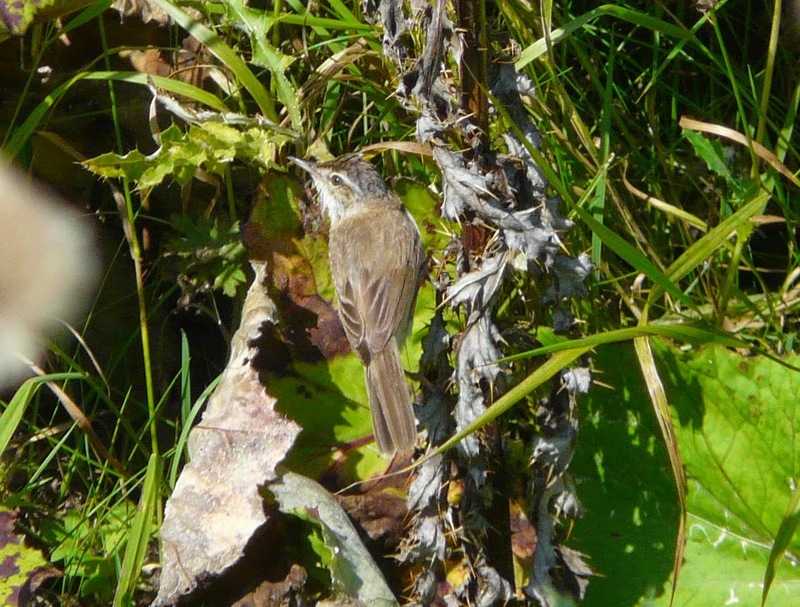 But the star bird-a Paddyfield Warbler in thistles at Stennabrek wasn't found until 6.30pm just as Fish and Chips was being served up to the guests. Dinner was delayed and this 4th for the island (and the 3rd in 3 years) was generally elusive but did show well a few times. There were also a few raptors about with at least 3 Kestrels, the first Merlin of the autumn (a female), Hen Harrier and Sparrowhawk all seen, while 3 Little Stints and the lingering Spotted Redshank were the best of the waders. A couple of Rock Pipits were new and 3 Common Rosefinches probably included a new bird which shared a field at Stennabrek with the Paddyfield. Another fine day with similar numbers of some of the familiar migrants while the sea-watchers had their best day of the week so far. A four hour vigil from the hide saw 42 Sooty and 20 Manx Shearwaters pass by, along with 3 Storm Petrels, 744 Gannets and a 'blue' Fulmar. 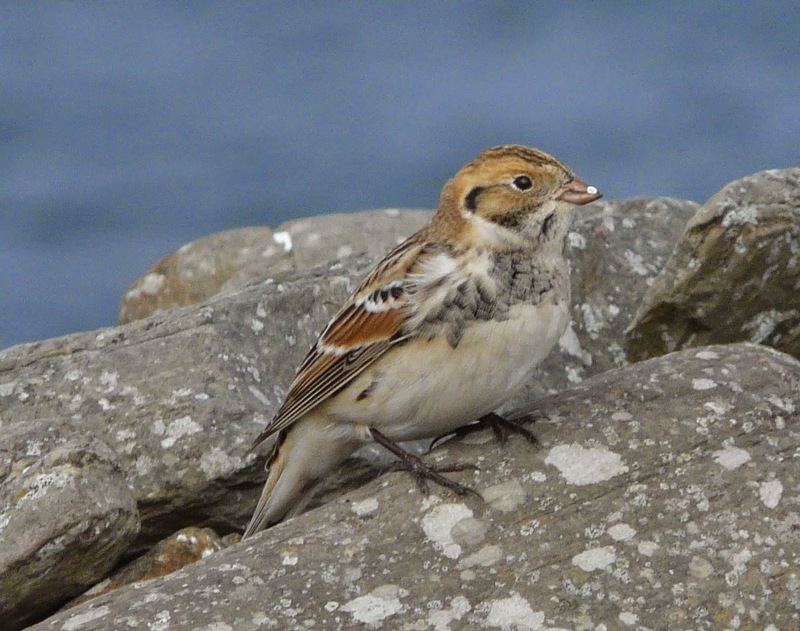 A Little Stint was on the links and a Lapland Bunting and 3 Pied Flycatchers were the most notable passerine among low numbers (of mainly lingering) Warblers. The Autumn's first Lapland Bunting arrived on 1st whilst the Spotted Redshank remained both days as did the 3 Common Rosefinches at Holland House; all of which we assume, were trapped and ringed on 2nd. A Little Stint and Wood Sandpiper on Gretchen Loch on 1st were followed by 3 of the former at Trolla Vatn the next day, when an altogether busier day produced 4 Barred Warblers, the first 2 Goldcrests, a Robin was new at the Lighthouse, 4 Whinchat, a Tree Pipit, 13 White Wagtails, 3 Swifts, 2 Garden Warblers and 3 Whimbrel. Meanwhile seawatching improved with 17 Sooty and 21 Manx Shearwater, a 'Blue' Fulmar and 4 Storm Petrels. 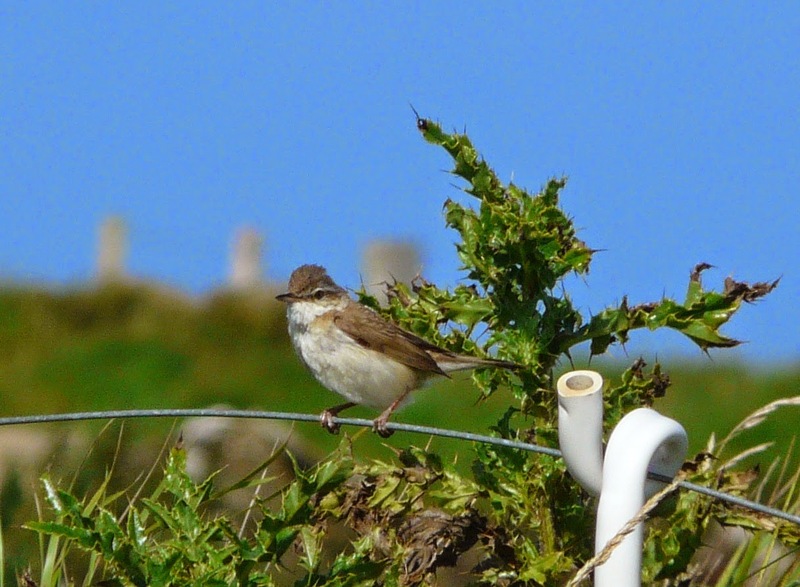 Wrapping up August as we go into the most eagerly anticipated month for birdwatchers on the island, we have to mention it was another cracking day. In fact the whole month has felt very 'summery' with plenty of sunshine. Birding highlights were similar to recent days with at least 3 Barred Warblers (a new bird ringed and at least 1 other new arrival), 3 lingering Common Rosefinches, the Red-backed Shrike, Wood Warbler, Wood Sandpiper and a Little Stint. There was some visible movement too with 22 of 121 Swallows and 15 of 161 Meadow Pipits noted migrating south down the west coast. 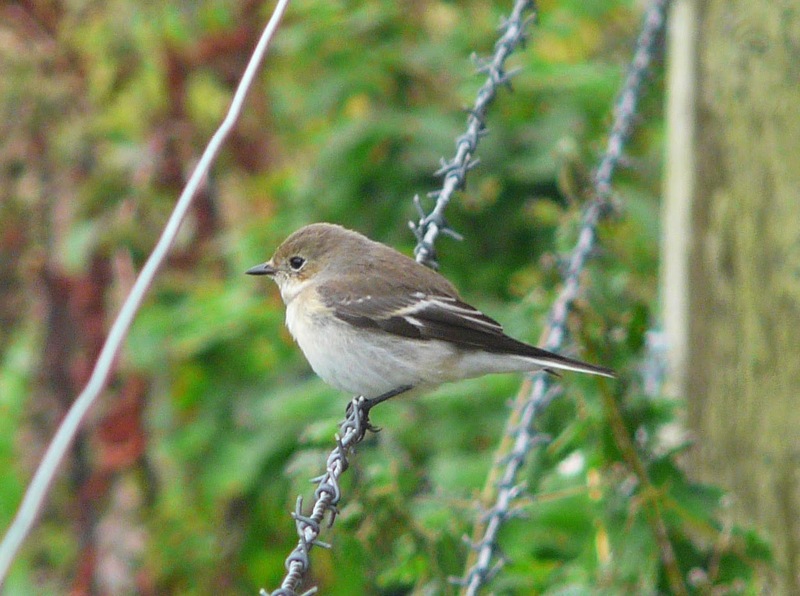 There was also 4 Swifts, a Tree Pipit, 3 Whinchats, 5 Garden and 19 Willow Warblers and also 4 Pied Flycatchers. We'd like to thank all who supported our 'Friends of NRBO' summer prize draw-we'll contact the winners during the first week of September and announce them here, on the 'friends' page and also on twitter and facebook. The competition is now closed but we still need your support for on-going projects and there are several benefits in joining, including accommodation discounts. Follow the link on the homepage for more information. Thank you.